This is one of the most thorough and scientific restoration exercises undertaken in the history of Indian monuments. 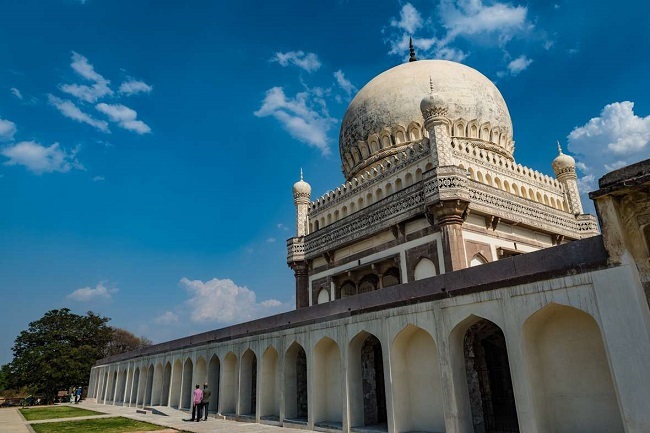 After five years of being closed to the public for restoration, the tombs of the first five Qutb Shahi kings have been, once again, declared open to visitors. If you have visited the tombs before the restoration, you are in for a treat – the level of the ground has changed, and a whole layer of architectural treasures have been unearthed. 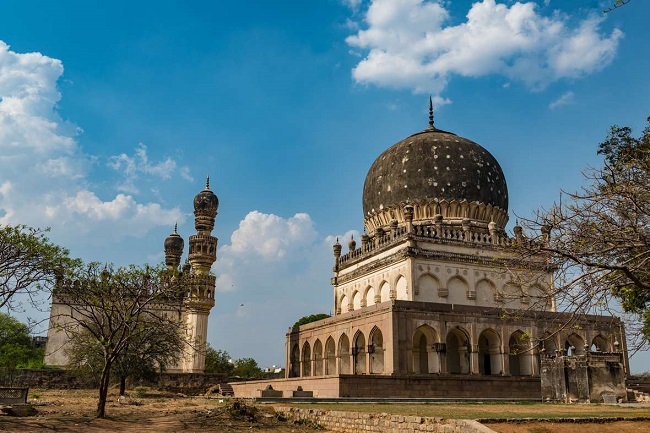 Traces of the entire area being a garden along with markers for the layout of the place during the reign of Ibrahim Quli Qutb Shah, who was king from 1550 to 1580 CE, have been discovered. 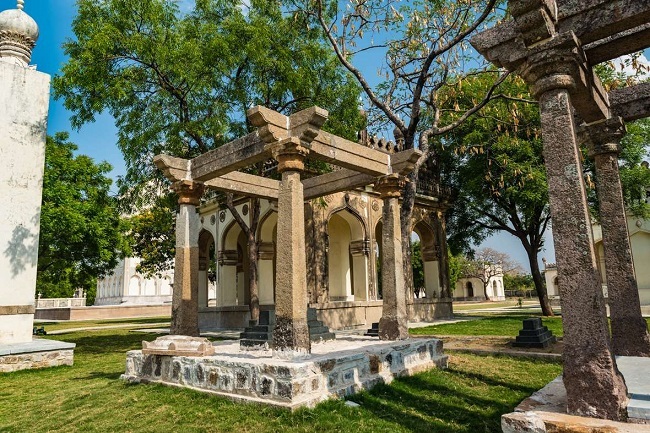 This has enabled the Aga Khan Trust for Culture (AKTC), who is the agency executing the restoration of the tombs, to recreate the layout from more than four centuries ago. This is one of the most thorough and scientific restoration exercises undertaken in the history of Indian monuments. Even before signing a Memorandum of Understanding (MoU) with the government for the restoration, the AKTC conducted a one-year study to understand and estimate the feasibility of the project. Once the restoration began in January 2013, the painstaking task of separating the original structures from all the previous restoration attempts started. Each monument was documented in a very detailed manner – the physical condition, the damage from different causes, how it looked when it was constructed. The sources for these included archaeological evidences and archival material. Once this was done, the restoration itself was carried out by master craftspeople, using techniques and materials which were used by the original builders. The structures were also finished in a way that natural organic material would appear with time. 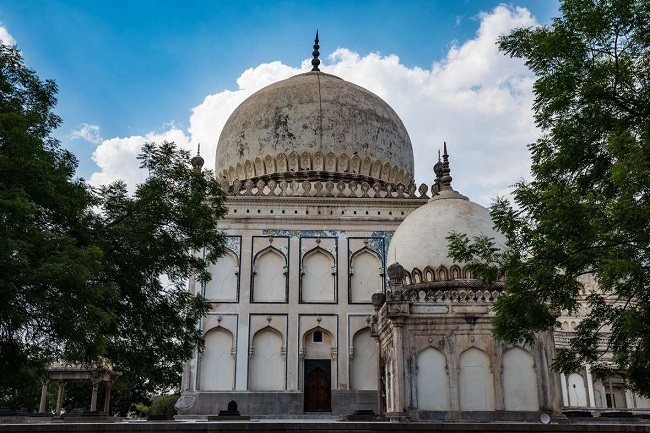 The hero of the complex is the massive tomb of Mohammad Quli Qutb Shah, fabled lover and later husband of Bhagmati, builder of Hyderabad, and the iconic Charminar, and arguably one of the richest kings of his day. His tomb towers over the others – the platform within which lies the crypt where he lies buried is itself massive and pierced by arched entrances that lead to the royal tomb. Atop this platform stands the grandiose memorial structure – following the same structure as the other tombs, but on a scale entirely different from them. There is a lot of decoration on the balconies and minarets, but the overwhelming feeling is one of magnificence and majesty, triggered by the sheer size of the monument. To the south of this and slightly to the west lies the tomb of his father Ibrahim. More modestly sized, but unique in its decoration with its painted frames, this tomb still has a few of the colourful tiles that must have once adorned it. It gives us an idea of how resplendent the tombs must have been in their heyday, serving not only as memorials to kings past, but also as reminders of the power they wielded. 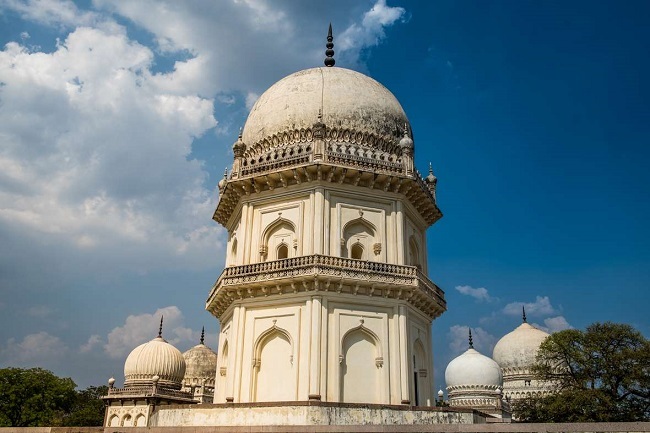 Grand edifices have always been about showing off power and might, and the Qutb Shahi tombs are no exception. Further south lies the main gate to the necropolis and the Golkonda fort, which was capital to the first four kings, and the powerful citadel to the very end, is visible beyond it. The gate is now buried under centuries of dirt, and recent excavations have unearthed part of it. The entrance itself is bricked up, but the masjid on top of it is well preserved and a prime example of a Qutb Shahi mosque, with elaborate and intricate decorations. Immediately to the west of the tomb of Muhammad is his daughter, Kulthoom Begum’s tomb. This is smaller and more austere, though the grace of the bulbous dome is unmistakable. Further west lies the tomb of the patricidal Jamsheed. This is an octagonal tower, breaking from the design tradition of all the other tombs. 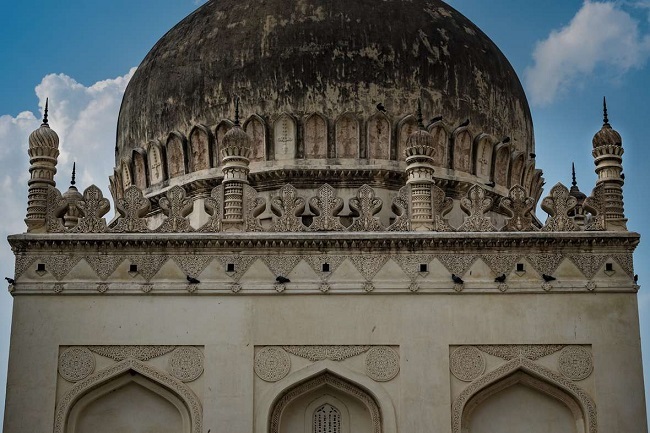 The second Qutb Shahi sultan was a patron of the arts, and clearly his interest extended to architecture as his tomb is arguably the most exquisitely beautiful building in the complex. To the northeast of the octagonal tower are two tombs together. 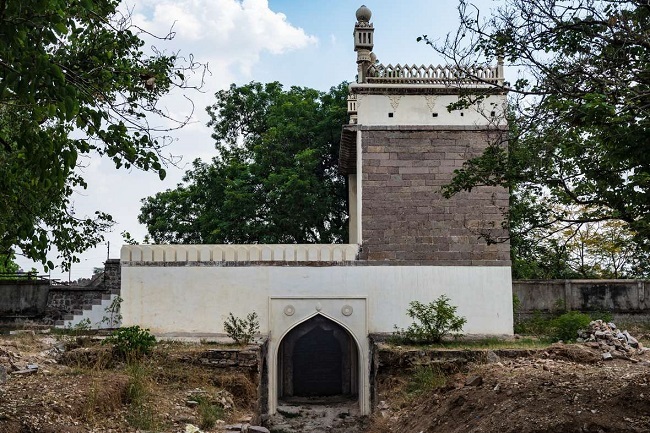 The squatter, slightly larger tomb is that of Sultan Quli Qutb Shah, the founder of the dynasty and first king to be entombed in the complex. 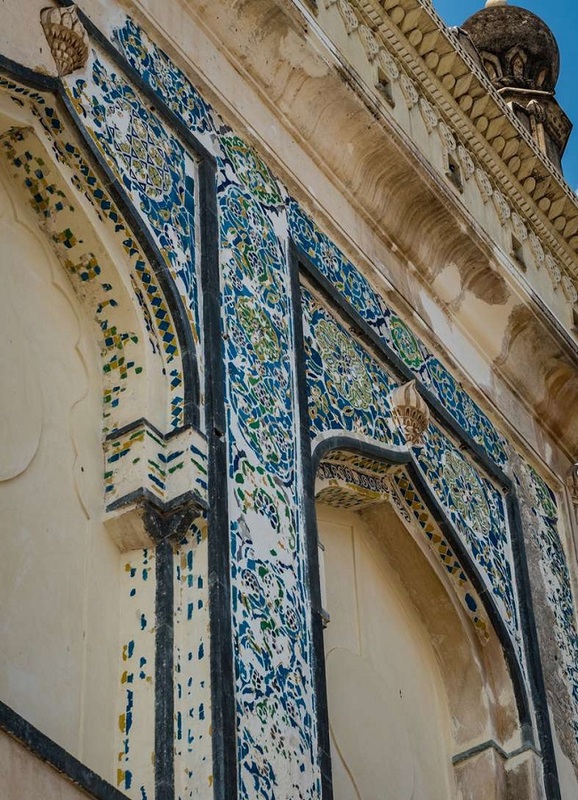 Although it is the oldest tomb in the complex, it is also the most intricately decorated – a closer look reveals the facades of the balconies as well as the bulbous tops of the minarets intricately carved with patterns. One can stand back and look at the tomb of the first sultan with that of the fifth sultan in the background, and the comparison is stark – the most intricately decorated tomb versus the most magnificently massive. Right next to the first sultan’s tomb is that of the boy king Subhan, all of seven years old when he was crowned, and all of seven years old when he was deposed by his uncle Ibrahim. 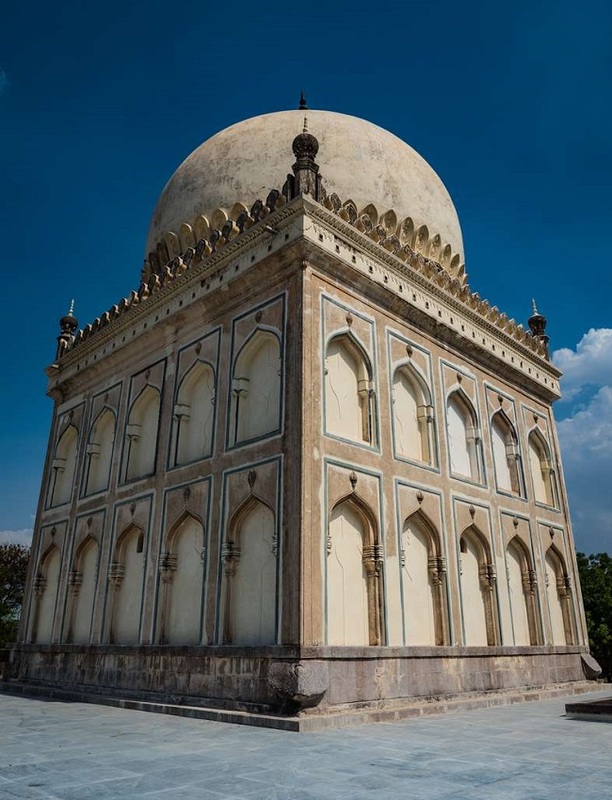 While it is unclear if he was killed or fell prey to illness, it is clear his tomb was built with care, for it is unique with its striped dome and graceful lines and is also the smallest of the lot. Between the massive royal tombs, and sometimes right within them, lie buried hundreds of family members, friends of the court, and generally anyone who was in royal favour when they passed. A bunch of these graves can be spotted within the complex, and some of them illustrate the prevailing mortuary architecture of their times. 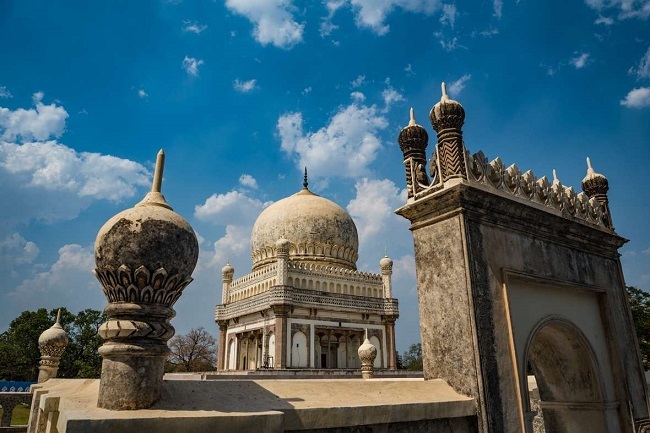 There are three graves – one right on the plinth of Ibrahim’s tomb and two in the straight line between this and Jamsheed’s tomb which have a pillared roof carved in typical Indian style, reminiscent of temple pillars. These are the tombs that lie within the zone that has been restored. 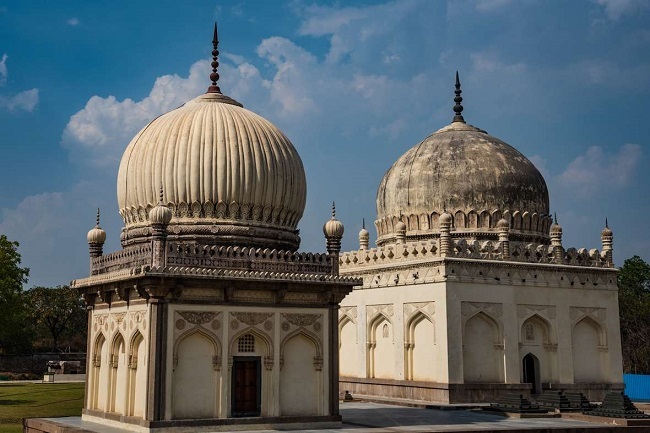 There are three major tombs that are yet to be renovated - that of Sultan Muhammad, Muhammad’s son-in-law and successor, Hayat Bakshi Begum, Sultan Muhammad’s wife, and Abdullah, their son and the seventh king (if you count Subhan, which I do, but some folks don’t). 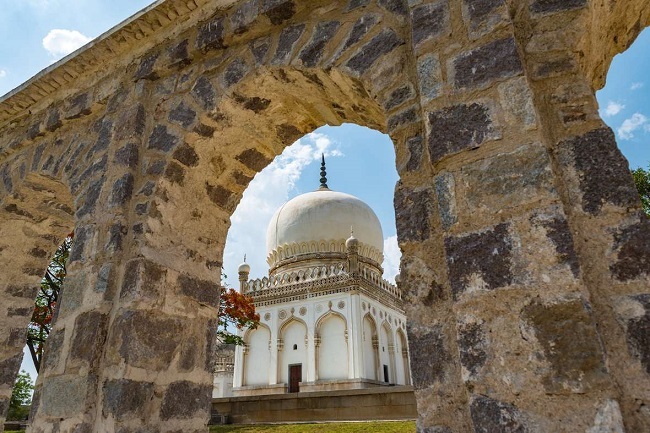 The Qutb Shahi tombs are open to the public from 9.30 am to 5.30 pm, and tickets are Rs 15 (Rs 50 for non-Indians), plus Rs 50 for a camera, even if it’s part of your phone. Mornings and evenings are the best time to visit to avoid the midday heat. 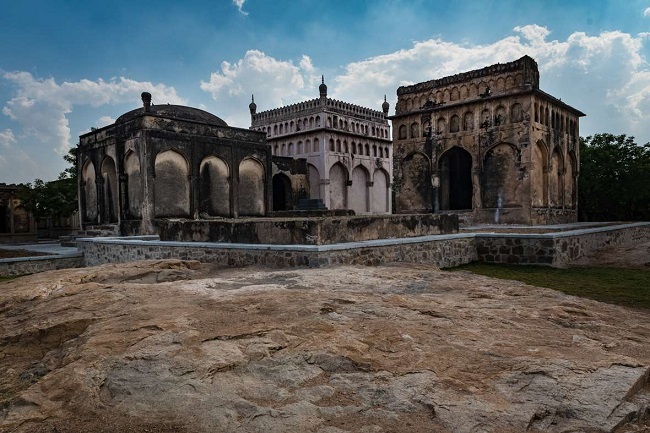 Navin Sigamany is a photographer and heritage enthusiast based in Hyderabad.